Above: Products for a fresh springtime look. It's Face of the Day (FOTD) time and what better way to create a fresh look then with a fusion of milkmaid braids and new products! I am excited to share some of my latest procurements from Eve Lom, Napoleon Perdis, Vincent Longo, MustaeV and Hourglass as well as some classic staples from Surratt Beauty, Jenny Patinkin, Clé de Peau Beauté and Marc Jacobs. Above: A preview of the cumulative look. Above: The brand new Eve Lom Brightening Cream. (1) I began by prepping my skin with the recently released *Eve Lom Brightening Cream. This silky infusion of dullness-banishing hydration harnesses the power of anti-oxidants to fight dark spots and inprove the overall clarity of the skin. Although I am still in the early stages of testing this lovely, faintly rose-scented formula (and thereby cannot speak to brighten with long-term usage), I am impressed by its immediate moisture; it instantly absorbs into the skin and creates a balanced canvas for primer and the makeup to come. Sublime. Above: The full ingredients list (click image to enlarge). Above: The cream is lushly hydrating while still being inordinately light. From April 15th-April 26th, Space.NK will be featuring its Discover Promotion...during this time, $20 will be taken off of your online order of $75 or more with the the promo code Discover15. This is the perfect time to try something new and I invite you to give this luxe cream from Eve Lom a try! Above: My priming bases for face and body. (2) After moisturizing with the Eve Lom Brightening Cream, I followed with the *Napoleon Perdis Auto Pilot Pre-Foundation Primer. Although this primer feels like nothing (it is delightfully devoid of that ultra-slick 'cone feel) on the skin, its ability to smooth away pores and fine lines upon contact is a delight. Its true value, however, is the way with which in interacts with foundation; it pairs beautifully with the custom mix discussed later on in this post, exponentially extending its longevity and performance. I finished my "priming" with a spritz of the modern classic Byredo Gypsy Water (reviewed HERE). The clean yet bohemian vibe worked perfectly with my milkmaid braids! 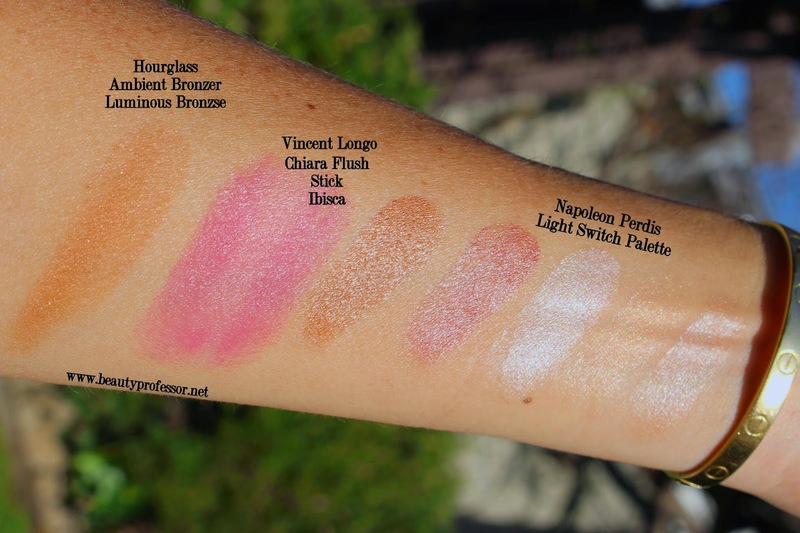 Above: Swatches of the Eve Lom Brightening Cream and Napoleon Perdis Auto Pilot Primer in direct sunlight. Above: Componets for a customized base. (3) In terms of foundation, I have been loving a current custom mix involving a stick and a liquid. I first apply the *Napoleon Perdis Stick Foundation in Look 3 (buildable coverage, a natural finish and immense lasting power...great for NC 25-27 skin) broad stripes across the my face. Then, I place one pump of the *MustaeV Skinny Tint Foundation in Bright Beige (a full review of this incredible formula forthcoming) on the back of my hand and subsequently buff it into the center of my face (inner cheeks, forehead, nose and chin) with a damp Beauty Blender. This delivers a creamy light to the middle of my face and adds depth to the outer regions of my face for balance and dimension. The formulas work so well together, yeilding medium to full coverage that looks dewy and entirely natural while simultaneously lasting the entire day without a single need for touch ups! For my undereyes, I swipe a bit of the Clé de Peau Beauté Concealer in Beige (reviewed HERE) in a reverse triangle shape and blend with a Beauty Blender Micro Mini for brightening. 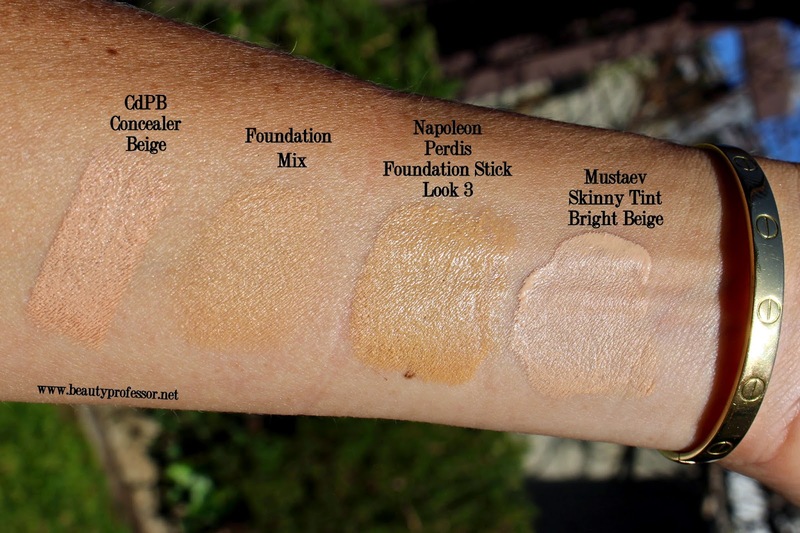 Above: Swatches of my base products in direct sunlight. Above: It's all about a warm, rose-gold glow. (4) For cheeks, I swept a generous amount of the stunning *Hourglass Ambient Bronzer in Luminous Bronze Glow (reviewed HERE) along my cheek bones, jawline and down the bridge of my nose. This bronzer, incidentally, has all but hijacked my beauty routine as of late! Then, I tapped a touch of the freshly released *Vincent Longo Chiara Flush Stick in Ibisca along the apples of my cheeks for a dewy, rosy glow. Finally, I embraced a spectrum of shades in the genius *Napoleon Perdis Light Switch Luminizer Palette (reviewed HERE) to add highlight and radiance to the high points of my face. The more I use this gem, the more I see its utility...for example, I used a combination of the bronze and rosy bronze shades and tapped them onto my eyelids, using a small brush to sweep the same duo along my lower lash line. In sum, this singular creme palette effortlessly took care of my facial highlighting and eyeshadow needs in mere minutes! 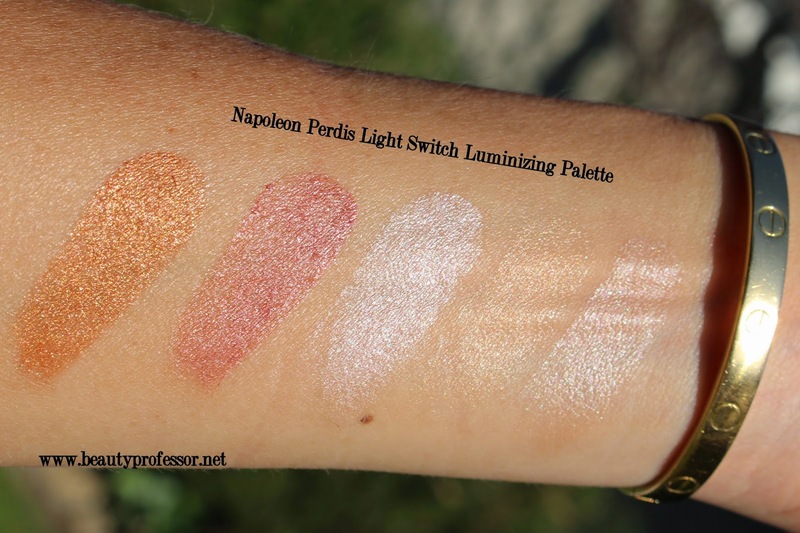 Above: Swatches of the Napoleon Perdis Light Switch Palette. Above: I also used the Light Switch Palette for my eyes! 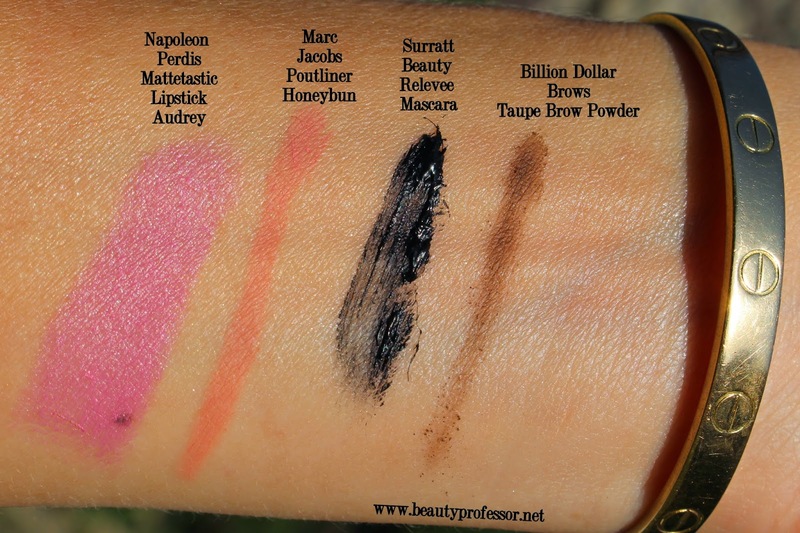 Above: Swatches of all cheek and eye products (except mascara) in direct sunlight. (5) Finally, I used a touch of *Billion Dollar Brows Taupe Brow Powder (applied with a *Jenny Patinkin Angled Brow Brush) to define brows and added two coats of the Surratt Relevee Mascara (reviewed HERE) to add volume and length to my lashes. I lightly lined lips with the Marc Jacobs Poutliner in Honeybun (a super favorite) and applied the resplendent *Napoleon Perdis Mattetastic Lipstick in Audrey, a luminous yet matte, light pink with just enough depth to appear chic and sophisticated rather than overtly girly. It is hydrating (especially for a matte formula), long lasting and endlessly flattering; I must admit, I have been using this lipstick non-stop, much to the neglect of about 200 other shades in my collection! It's truly a delight. Above: Swatches of lip, lash and brow products. By the way, if any of the Napoleon Perdis products catch your fancy (they have been utterly invaluable in my routine lately! ), I am happy to share an exclusive promo code for Beauty Professor readers, good at NapoleonPerdis.com and the Napoleon Perdis Flagship Store on Hollywood Blvd. Simply type in the code: NPLovesBeautyProfessor for 20% off of your purchase (excluding sale items and brushes), now through 5/7/15! Above: Napoleon Perdis Mattetastic Lipstick in Audrey...the quintessential light pink. Bottom Line: I hope you enjoyed this Face of the Day look and would love to know which products are currently inspiring YOU! Good things ahead, including posts featuring Jouer, Mila Moursi, Kate Somerville and Gressa! I'm absolutely loving your foundation alchemy and your crown-looking braids! I'm currently mixing Chanel's vitalumiere acqua with by Terry's Sheer Expert but I'm unsatisfied. I have to try your gold making formula! Thank you ever so much, my friend! I can't wait to hear what you think of this foundation mixture if you end up trying it...truly, I've been doing this daily and am still loving the outcome! Greetings, dear Lynn...happy spring to you! I think you'll love the customization of the Cover FX drops and yes, teh MustaeV foundation is incredible--the perfect blend of coverage and dewiness, with good lasting power. I suspect you will love it as I do! Also dying to purchase the hourglass new bronzer!!! Stunning! YES!! You absolutely need this...the luminosity is unparalleled! Also wanted to try the Surrat eye baton but they are all out of stock at the moment :( love your post on all your favs in his line. I love hearing about your Sephora VIB haul, Lynn...I knew you'd love the Hourglass bronzer! I was wondering, would you ever be able to do a compilation of the very palest foundations you know of? I'm thinking kevyn aucoin SX01/NC10 sort of shades, which are utterly impossible to find! Thank you...it's been a favorite as of late! I love your request and will see what I can do! Thank you for the lovely comment, Tequila!!! I much enjoyed reading your description of some of your current favorites...simply marvelous!